The Fireside Chat is located in Room Two of the FDR Memorial. The lone barefoot man sits on a broken chair. The upper horizontal support between the left front and the left rear legs is missing. But he is engaged, leaning forward, eyes closed, hands clasped, as President Roosevelt talks to him through the radio on the small side table. 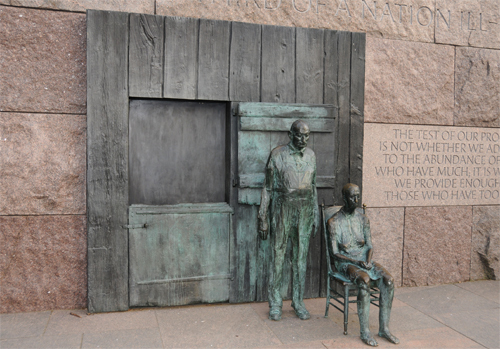 Room Two covers the time of the Great Depression, and this sculpture reflects the hope that many people felt that President Roosevelt would lead them through the difficult times. I never forget that I live in a house owned by all the American people and that I have been given their trust. 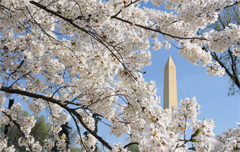 The Franklin Delano Roosevelt Memorial is located on the southwest edge of the Tidal Basin accessible by foot from the path around the edge of the Tidal Basin with another entrance on West Basin Drive SW in Washington DC. 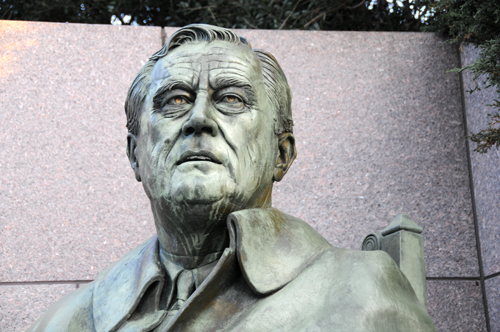 Click Here for Google Map showing the location of the sculpture The Fireside Chat in Room Two of the Franklin Delano Roosevelt Memorial. 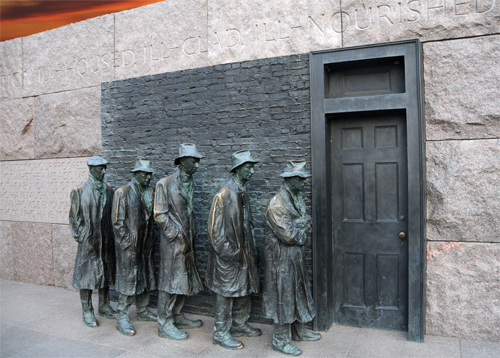 The Breadline is located in Room Two of the FDR Memorial. The five figures in the sculpture, all male, all with eyes downcast and all dressed in long coats and hats as a defense against the cold, stand in line against a brick wall and wait for food that may be only bread. The windowless wooden door they all face remains closed in front of them. Room Two covers the time of the Great Depression, and this sculpture reflects the difficulties encountered by many people. I see one-third of a nation ill-housed, ill-clad, and ill-nourished. The test of our progress is not whether we add more to the abundance of those who have much; it is whether we provide enough for those who have too little. 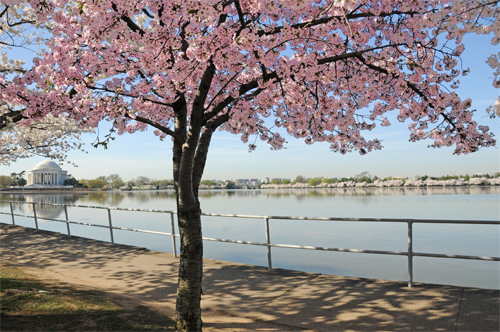 The Franklin Delano Roosevelt Memorial is located on the southwest edge of the Tidal Basin accessible by foot from the path around the edge of the Tidal Basin with another entrance on West Basin Drive SW in Washington DC. 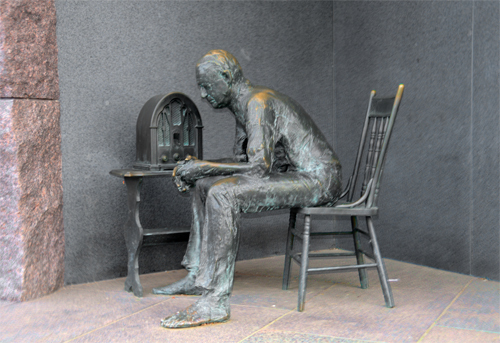 Click Here for Google Map showing the location of the sculpture The Breadline in Room Two of the Franklin Delano Roosevelt Memorial. 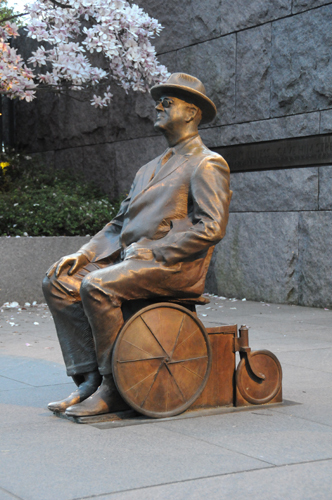 The sculpture is located in Room Two of the FDR Memorial. The figures are both mature and solemn with eyes downcast. The man stands and the woman sits in a wooden chair before what appears to be a barn wall made of rough hewn wood. To the couple’s right is a stable door with the upper half of the door swung open into a position flat against the barn wall. Only a dull, flat surface is visible through the open part of the door. Room Two acknowledges and this sculpture reflects the privation of the Great Depression. The Franklin Delano Roosevelt Memorial is located on the southwest edge of the Tidal Basin accessible by foot from the path around the edge of the Tidal Basin with another entrance on West Basin Drive SW in Washington DC. 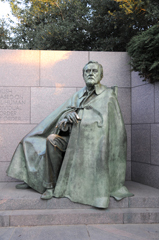 Click Here for Google Map showing the location of the sculpture The Rural Couple in Room Two of the Franklin Delano Roosevelt Memorial. This sculpture of Eleanor Roosevelt was created by sculptor Neil Estern. 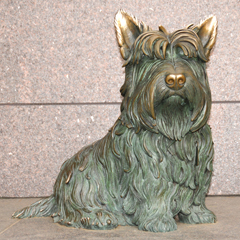 Neil Estern also created the seated figure of Franklin Delano Roosevelt with his dog Fala nearby. 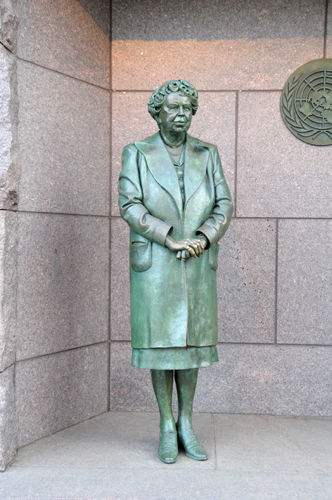 The statue of Elanor Roosevelt is located in Room Four of the FDR Memorial. In the background is a United Nations seal. Eleanor Roosevelt was one first delegates from the United States to the UN. Eleanor Roosevelt is in one respect first of First Ladies, as the first First Lady to be recognized in sculpture in a presidential memorial. Room Four reflects President Roosevelt’s brief fourth term. 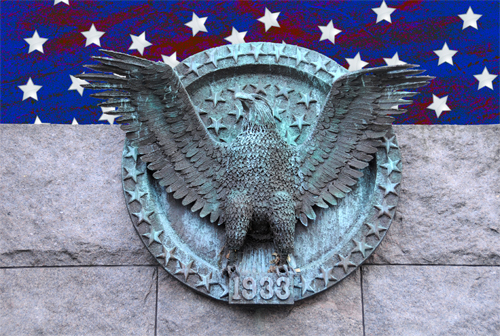 He took the oath of office for the fourth time on January 20, 1945 and passed away a short time later on April 12, 1945 only days before the end of World War II in Europe. The Franklin Delano Roosevelt Memorial is located on the southwest edge of the Tidal Basin accessible by foot from the path around the edge of the Tidal Basin with another entrance on West Basin Drive SW in Washington DC. Click Here for Google Map showing the location of the Eleanor Roosevelt Statute in the Franklin Delano Roosevelt Memorial. 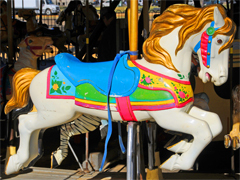 The best (in fact only) children’s ride on the National Mall is a colorful, old-fashioned carousel. S. Dillon Ripley (1913 – 2001) was the eighth Secretary of the Smithsonian Institution, serving from 1964 to 1984. 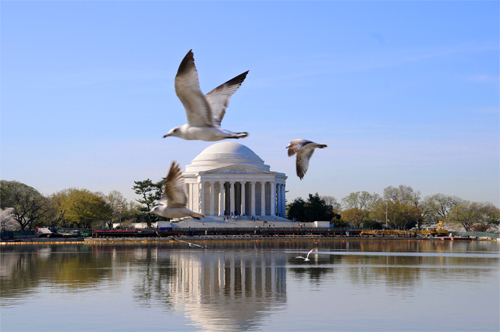 In the Spring of 1967 he put a carousel on the mall. 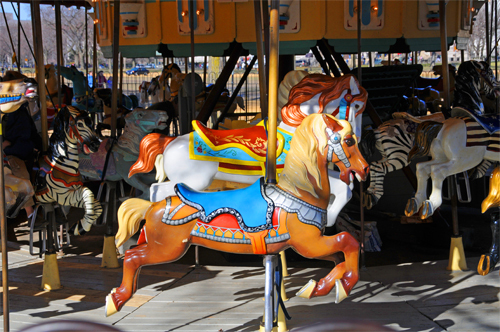 The Carousel on the Mall is located on the southern edge of the National Mall at Jefferson Drive SW directly in front of the Smithsonian Institution Arts and Industries building. Click Here for Google Map showing the location of the Carousel on the Mall. 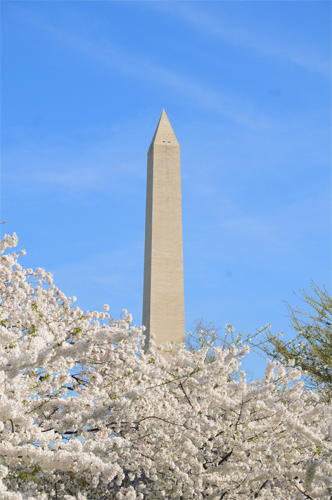 Closest Metro Station: The Smithsonian Metro Station on the Blue and Orange Lines is nearest to the Carousel on the Mall.